Patricia Keeney is an award-winning poet, novelist, theatre and literary critic. The author of ten books of poetry and two novels and a well-known arts writer for many years for CBC Radio, Canadian Forum, Scene Changes, Canadian Theatre Review and Canadian Literature, Keeney continues her critical work both nationally and internationally in journals such as Arc and online: Critical Stages and Critically Speaking. Keeney teaches English and Creative Writing at York University. 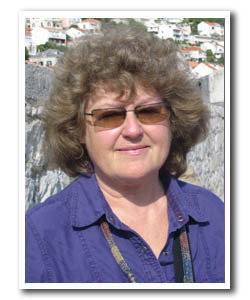 An avid traveller she has also taught and lectured in Europe, Africa and Asia. Keeney’s poetry has been translated and published in French Spanish, Bulgarian, Chinese and Hindi while her Selected Poems (Oberon) carries an introduction by the distinguished Russian poet Yevgeny Yevtushenko. She describes her latest poetry volume, Orpheus in Our World (NeoPoiesis) as an exercise in poetic archeology connecting the earliest and rarely translated Greek hymns with a post-modern theatrical dialogue. Her first novel, The Incredible Shrinking Wife (Black Moss), a post feminist satire of emotional depth and lyric intensity received much attention. Keeney’s latest novel brings her longstanding theatre knowledge into play. One Man Dancing (Inanna) is a story of Africa, and art set on the world stage. Based on the life of a Ugandan actor who became a political refugee in Canada after almost being assassinated by Idi Amin while working for Africa’s most experimental theatre company, Abafumi, One Man Dancing explores the role of human endurance and artistic risk in making political change. See Patricia Keeney’s website: Wapitiwords. ca.